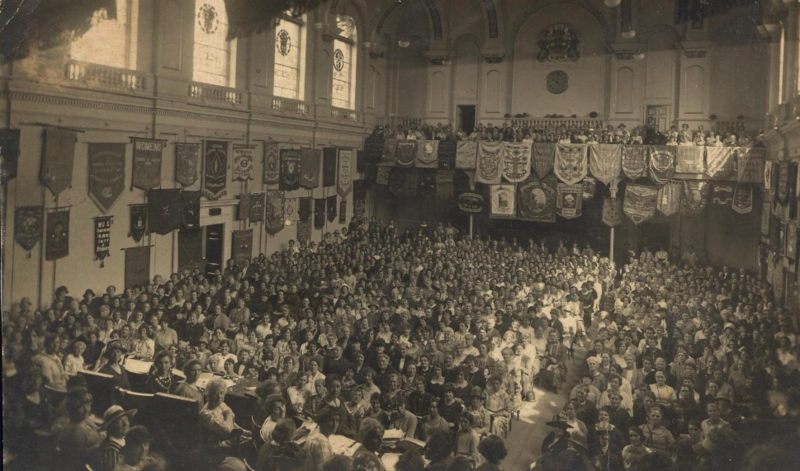 An early meeting of the Women's Co-operative Guild in London, c. 1910. In July 2013, then-justice secretary Chris Grayling announced the government was introducing employment tribunal fees, meaning that anyone seeking to take their employer to court would have to pay up to £1200 for the privilege. This move was typical of Grayling’s time in charge of Britain’s legal system, which also saw him ban books in prison and restrict legal aid for victims of domestic violence. Luckily for Britain, frothing upper-class contempt doesn’t usually make for good legal practice, and in July 2017 the Supreme Court declared Grayling’s fees unlawful, thanks largely to a heroic campaign by the trade union UNISON. This might seem like the end of a short and cheerful story: an anti-worker policy is introduced by an anti-worker government, spends a few years making life more miserable for anyone unfortunate enough to encounter it, before being overturned by a group of valiant activists working through the courts. Predictably, the number of claims filed since fees were annulled has skyrocketed, up 118% on the roughly 18,000 recorded in 2016. And though the government has been despicably slow to issue refunds to claimants who filed between 2013 and 2017, more than £4 million has since been repaid – proof, if it were needed, that there is still power in a union. Before you start singing The Internationale, however, consider this pair of statistics: according to a 2018 survey, 37% of women that year were sexually harassed at work, while 39% witnessed a colleague’s sexual harassment. This amounts, roughly, to 5.5 million female victims of workplace sexual harassment. Now compare that figure to the eighteen sexual harassment claims that were heard in court last year. This is a disparity so vast that there is nothing even worth saying in qualification of it. Some have suggested that the #MeToo movement might inaugurate a golden age of sexual harassment litigation, but what is the most significant uptick in that 18-tribunals figure it could realistically spark? The dispiriting truth is that the number of cases brought to tribunal could increase a thousandfold and still be vastly outstripped by the number of breaches. The size of this gap reveals the limits of a purely legalistic approach to tribunals. Liberating workers from fees was necessary, and a well-funded legal aid system would benefit those seeking to sue, especially if its provisions were actually allowed to go towards claims. There is also the encumbrance of a short limitation period, meaning that workers can only bring claims for a few months after the breach occurs. Abolish that, and you provide some with the time to stump up the cash for representation. But after this, there’s not much room for manoeuvre left within our current strictures. At some point, you have to reckon with the problem of tribunals as it actually is: a function of a deeply broken employment system. A proliferation of tribunals is, as a basic principle, a good thing: a sign of an emboldened workforce, and a way of instilling a healthy element of fear into bosses. An absence of them, other things being equal, is therefore a bad thing, and an absence as large as we have in the UK would seem to be a very bad thing indeed. But what informs this absence? Why would someone swallow their claim and keep schtum? It isn’t just a lack of money, or the deadline imposed by the limitation period. There are other, less tangible obstacles in play. For one thing, the boss of the company you’re suing is unlikely to recommend you for promotion, or provide you with a good reference when the office atmosphere sours. There are also the emotional obstacles to a claim – shame, guilt, fear of isolation or retribution. Reporting a breach often means spilling your emotional guts for an audience of the uninterested and the unsympathetic. Each of these alone provides sufficient reason to keep quiet; supplement them with an array of bureaucratic measures – ET1 forms, witness statements and courtroom etiquette rules – and it’s hard to see how anyone makes it to tribunal at all. Colouring all of this is a profound economic imbalance, the workplace consequence of class warfare. Predictably, breaches are unevenly levied on poorer people with precarious employment status – 58% of women on zero-hours contracts will be sexually harassed, a figure that jumps to 90% for women in the hospitality sector. And of course, black women are over-represented in these statistics – 16% more likely to experience sexual harassment than their white counterparts, then 4% more likely to leave their jobs as a result. The most remarkable stat comes courtesy of a 2018 TUC survey, which found that not a single BAME woman who made a sexual harassment complaint felt their case was resolved satisfactorily. And it isn’t only harassment; all sorts of breaches have class contexts. People in unstable jobs are far more likely to discover that their wages have gone unpaid, or that their hours have been abruptly extended. One waitress we spoke to was asked to work longer hours than legally permitted, and then found her hours during quieter periods cut – and then cut again, until she was struggling to pay her bills. This phrase – Who was I supposed to go to? – illuminates another of the principal reasons we have so few employment tribunals in the UK. The modern workplace is not only a bleak and lonely place, it is also terrifyingly opaque. There’s a danger of getting too dewy-eyed about the era of muscular labour unions, but at least they provided an easily accessible channel of communication. A conversation with your rep would offer both a plan of action and the comforting security of solidarity. This solidarity has been bludgeoned out of the workplace by decades of union-busting and deregulation. Nowadays, many find themselves truly alone, a situation exacerbated by the miserable business of office politics. Internal channels do exist, but they’re largely impotent, and it’s striking how rare it is for people to be aware of them. Plus, silence is rewarded, as it demonstrates loyalty. The common language of workplace discrimination might sound personal, but really it describes something objective, a feature that has been designed into the modern workplace. Who are you supposed to go to for help? No one – that’s the point. No issue better demonstrates this opacity than equal pay. The premise of the 1970 Equal Pay Act – equal pay for equal work – is simple enough, but anyone actually interacting with the law will encounter an administrative maze of deceptions and dead ends. Before a case makes it to court, a claimant must first prove that the relevant positions are factually comparable; that is, that both parties are performing the same role. If they manage this, they have to show that the salary of their comparator is unequal to their own. This sounds easy enough: except, crucially, this disclosure is not mandated by the law, so claimants have to convince their employer – who they are suing – to reveal their comparator’s salary. This process is long, and expensive, which means that when claims are launched they are usually filed by groups large enough to take the financial hit of multi-year litigation. A 15,000-strong group action taken against Asda, for instance, has been grinding sluggishly onwards since 2014, and despite a recent victory is still far from resolution. When official bodies address the Tribunal Question, they tend to conceptualise these problems as distinct, each with solutions all their own. Thus the Women and Equalities Committee, after lamenting the dearth of sexual harassment tribunals, recommends extending the limitation period, introducing ‘punitive damages’ for employers and ‘reducing cost risks’ for employees. But if the financial burden were the main impediment to sexual harassment cases reaching tribunal, we’d have seen more than 18 of them in the year after fees were annulled. These pressures are not truly distinct; they are connected by a common cultural tissue. In the ambient background of the modern workplace – lurking, for many, just beyond expression – is a profound institutional powerlessness. Lacking the funds to go to tribunal is an especially palpable form of powerlessness, but powerlessness is also present in the feeling that tribunals are just more trouble than they’re worth. Signing an NDA because you don’t know if your job will exist if you don’t is an articulation of powerlessness, and powerlessness is what’s really being spoken by the private, individualising language of workplace discrimination – I felt awkward; I didn’t know where to turn. Sexual harassment, whatever else it might be, is also an articulation of power. Though poor women are vastly more vulnerable to it (something constantly elided by #MeToo), workplace harassment doesn’t necessarily map to the organisational structure of the workplace; instead, it expresses a gendered power imbalance that can impose itself upon that structure. Insisting on these terms of engagement is crucial, because it gestures at a possible remedy: an equitable distribution of power of a different kind. Worker democracy can be a tricky notion to get a handle on, because its history suggests a certain conceptual capaciousness. It points to a tradition that stretches from the German model of employee representation on boards, to the radical Mondragon co-operative in Spain, which has done away with boards altogether, instead placing all major decision-making power directly in the hands of its worker-members. We don’t wish to adjudicate between these two here (though interestingly, the version that found its way into the last Labour manifesto was closer to the former than the latter). The important thing is that they promise a redistribution of organisational power – and not through financial fine-tuning or hazy consciousness-raising, but by giving workers a hand on the lever of production. In discussing worker democracy, most critics understandably focus on the distribution of profits amongst the workers. Less attention has been paid to the kind of environments they engineer, or the kind of workers they create. If the modern worker is increasingly atomised, and encouraged to see their colleagues merely as competition, what perspective might a co-op worker have? Accounts of Mondragon often describe workers as sociable and confident, willing to upbraid their managers in a way unimaginable in traditional workplace hierarchies. And why shouldn’t they be? There’s no need to fear a frosty atmosphere if office arguments happen from an equal footing. Reporting back on his visit to Mondragon, the Marxist economist Richard Wolff described ‘a familiarity with and sense of responsibility for the enterprise as a whole that I associate only with top managers and directors in capitalist enterprises’. It’s clear that the convolutions of equal pay law benefit the managerial class only, but if contentious salaries were subject to workers’ discussion, they would not remain private. The same would be true for functionally equivalent roles that are assigned different titles. A general assembly could provide a regular check on institutional sexism, and transform the lives of working women everywhere. Worker democracy is not a panacea: any workplace will still involve regular disputes, the bulk of which will be navigated without recourse to official channels. But without the leverage of institutional power, employees are reduced to playing footsie with bosses, attempting to convince them to address breaches through goodwill alone. Plus, disagreeing as equals, free from anxiety or fear, with clear and powerful avenues of redress; this is a worthy objective. As for the loftier ambitions of the co-op, we can take instruction from further abroad than Germany and Spain. Recently, we interviewed a Kurdish activist who said that when she married her husband he was kind, helpful – an eager participant in the Kurdish model of anarcho-feminist democracy. When they left the confines of the Kurdish movement for Europe, however, she began to notice a change in his approach to domesticity. Increasingly, he would demand that she stay at home and look after their children while he worked. Before, when their domestic interactions had occurred against the backdrop of the movement, she had an avenue through which to redress this imbalance. In Europe, she was left to negotiate the abuses alone. The socialising of private injustice has a remarkable effect on its capacity to occur. It acts as a guide to good people, and as a deterrent to bad ones. In the short-run, workplace democracy would mean an explosion of tribunal claims. But once workplace organisation gives way for a new workplace culture, we may find that we’ve eradicated the behaviour that makes them necessary in the first place. Katie Barnes-Monaghan is an assistant editor at Thomson Reuters Practical Law.